Last month, Canada’s finance ministers announced an “agreement in principle” to expand the Canada Pension Plan (CPP), which will require workers to pay more into the program starting in 2019 in exchange for higher CPP retirement benefits in the future. As we have noted elsewhere, the case for expanding the CPP is based on either incorrect or highly debatable claims. One of these claims is that the CPP offers a competitive, even a high rate of return for Canadians. A recent Fraser Institute study calculated the rate of return that individual Canadians receive from their CPP contributions in the form of CPP retirement benefits under the existing system and found a meagre return for virtually all working Canadians. This blog updates the rate of return calculations based on the limited details available on the proposed CPP expansion. First, we should clarify the source of the mistaken claim that the CPP provides strong returns. It is driven by people conflating the rate of return on investments made by the CPP Investment Board (CPPIB), which manages the investable funds of the CPP, and the return earned by individual contributors. In reality, the returns of the CPPIB do not in any direct way influence the CPP retirement benefits received by individual Canadian workers. CPP retirement benefits are based on the number of years a person works, their earnings in each year (relative to the maximum under the CPP), and the age at which they retire. Before presenting the revised calculations, it is important to understand some of the key features of the current CPP. Contributions are made on earnings in excess of the annual exemption ($3,500) up to a maximum amount referred to as the Year’s Maximum Pensionable Earnings (YMPE). The YMPE in 2016 is $54,900, which changes every year with inflation. The combined rate of contribution (tax) is 9.9 per cent of the employee’s eligible earnings. Currently, the maximum annual total contribution to the CPP for an individual worker is approximately $5,089. Retirement benefits are designed to replace 25 per cent of a worker’s average annual pensionable earnings (their earnings between the annual exemption and the YMPE). Earnings above the YMPE are not included in the retirement benefit calculation. In 2016, the maximum retirement benefit (based on retirement at age 65) is $1,092 per month. In order to calculate the rate of return from the CPP for individual Canadians, a number of key assumptions have to be made that are fully detailed in the original study. 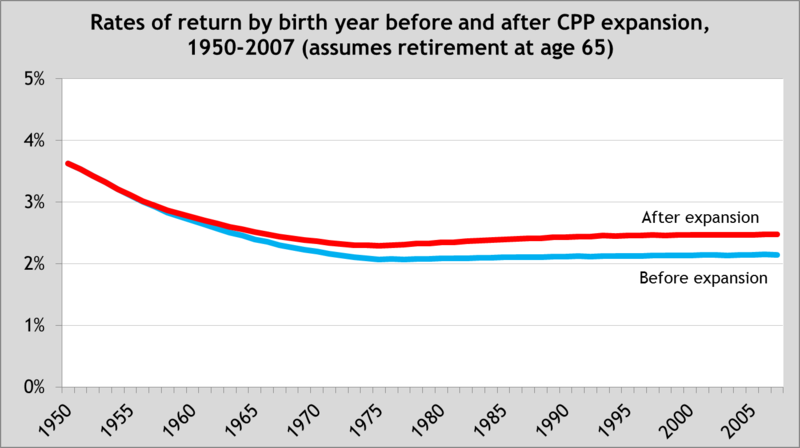 Under the existing CPP program (that is, before expansion), the rate of return that Canadian workers receive in the form of CPP retirement benefits compared to their contributions varies considerably depending on when the worker was born and retired. For instance, a worker born in 1905 who retired at age 65 in 1970—one of the first years Canadians received CPP benefits—would have enjoyed a 39.1 per cent rate of return after inflation. For Canadians born after 1956, however, the CPP rate of return is a meagre 3.0 per cent or less. The rate of return (adjusted for inflation) declines further to 2.1 per cent for those born after 1971 (see chart below). The rates of return declined for two main reasons. First, the contributory period in the CPP’s early years (10 years) was much less than is the case now (47 years). Second, the total contribution rate has increased from 3.6 per cent when the program was started in 1966 to its current level of 9.9 per cent. The total contribution rate will increase from 9.9 per cent to 11.9 per cent for earnings up to the YMPE. This increase will be phased in from 2019 to 2023. A new combined contribution rate of 8.0 per cent will be applied to additional earnings 14.0 per cent above the YMPE. This portion of the increased CPP contribution will be phased in from 2024 to 2025. In 2025, the YMPE is estimated to be $72,500 and the maximum income threshold for the 8.0 per cent contribution rate will be $82,700. In that year, the maximum additional CPP contributions as a result of expansion will amount to $2,200. CPP retirement benefits will also be increased. The replacement rate for pensionable earnings will increase from 25 per cent to 33 per cent. According to the Department of Finance, it will take “about 40 years” for the full increase in retirement benefits to be phased in (the calculations below assume 39 years). The Department of Finance has stated that like the current program, future benefits will be based on the years of contribution and actual contributions. To calculate the rate of return, we assume that the increase from a replacement rate of 25 per cent to 33 per cent will be phased-in in equal increments from 2019 to 2023. 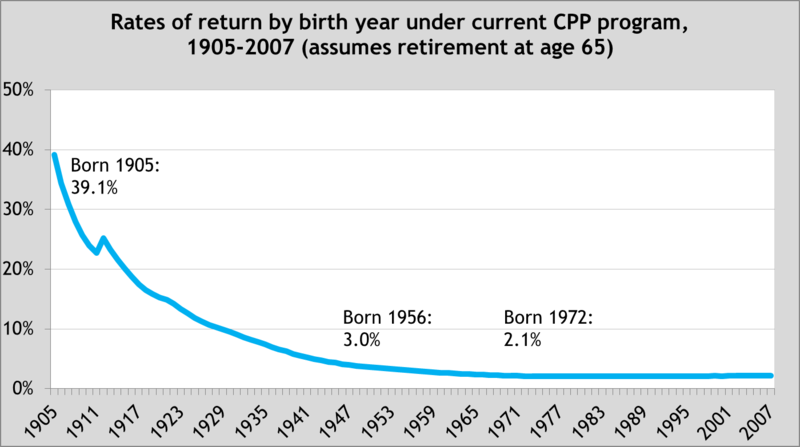 The chart below displays the inflation-adjusted rate of return before and after CPP expansion for individual contributors born from 1950 to 2007. The period ends in 2007 since Canadians born that year will begin contributing to CPP in 2025 (at age 18), making them the first cohort eligible to receive the full increase in CPP retirement benefits. The results displayed are for workers who earn the YMPE and retire at age 65. Under the expanded CPP, Canadians born after 1956 still receive a meagre rate of return of 3.0 per cent or less. The expanded CPP has resulted in modest increases in the expected rates of return for Canadian workers. For example, the rate of return for eligible workers born in 1971 to 1980 is 2.3 per cent. Those born in 1993 or later can expect to receive a 2.5 per cent rate of return (after inflation) from their CPP retirement benefits. In other words, there is only a small increase in the long-term rate of return for individual Canadians under the expanded CPP—2.5 per cent after expansion versus 2.1 per cent before expansion. Notably, the CPPIB itself must generate a 4.0 per cent return (after inflation) simply to keep the program actuarially sound. In other words, Canadian workers born in 1993 or after are required to contribute to a fund that must generate a 4.0 per cent rate of return in order to sustainably provide recipients with a 2.5 per cent return. A similar calculation is made for the rate of return for Canadians who will contribute to the CPP up to the maximum income level, 14 per cent above the YMPE. For these individuals, the long-term rate of return is slightly higher: 2.6 per cent for individuals born in 2001 or later. After taking account of the proposed changes to the CPP, the rate of return for individual Canadians remains meagre. Expansion of the CPP therefore cannot be justified on the basis of offering a strong rate of return to Canadians.